The M1917A is by no means the first monitor/TV combo we've seen. Plenty of similar devices have gone through the PC Plus labs in the past, but there is something about this product that really makes it stand out. 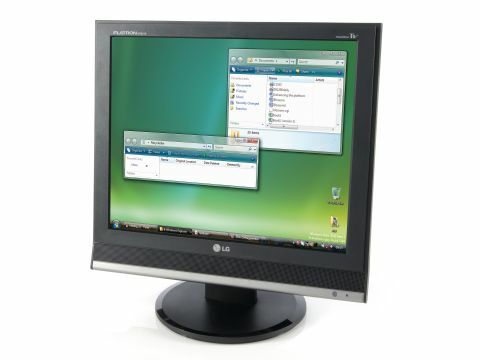 Unlike some others, which are generic screens with some rudimentary TV features bolted onto the side, this one is as much an LCD television as it a computer monitor. Looking at the inputs on the back, it seems PC connectivity takes a backseat, with only a single analogue D-sub plug. On the other hand, you have a SCART input, composite and even a prehistoric RF connector - standard fare for most TVs from the last ten years. Connecting a digital television box, games console or DVD player to the M1917A should be as simple as connecting to any other TV, although no digital connections are available on the unit itself. Analogue-only connectivity is not the only unusual aspect of the M1917A. As can be seen from the picture, LG is releasing a 4:3 TV monitor, when most new LCD screens have moved to a widescreen aspect ratio. This is probably because many channels still use the old format for broadcasting, so LG has played it safe to prevent TV signals from appearing to be squashed. As a monitor, the M1917A is not going to win any awards for a sharp picture or excellent colour reproduction. There are better options if you need something purely for work with text, digital imaging or anything precise. Running the auto calibration tool in the menu and adjusting the screen resolution helped, but the result isn't perfect. As a general purpose screen, though, it works well. Having both TV and PC functionality means space savings, and that's a definite benefit. You won't need to fiddle with a TV tuner or software in your PC, since you can just plug in any analogue device and you're set. The 8ms response time means it's fine for PC gaming or watching DVDs without any motion blur. These benefits, along with the low price tag, mean the M1917A is great for students in cramped rooms. Similarly, if you want a replacement for the analogue CRT in the kitchen or bedroom, then this monitor isn't a bad choice. Combine that with a small form factor PC and you can have a complete multimedia setup that fits anywhere.